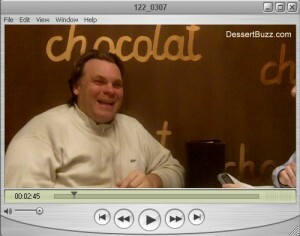 Dessert Buzz sat down with Francois Payard last Friday for an expansive interview. Here is Part II. Read part I here. 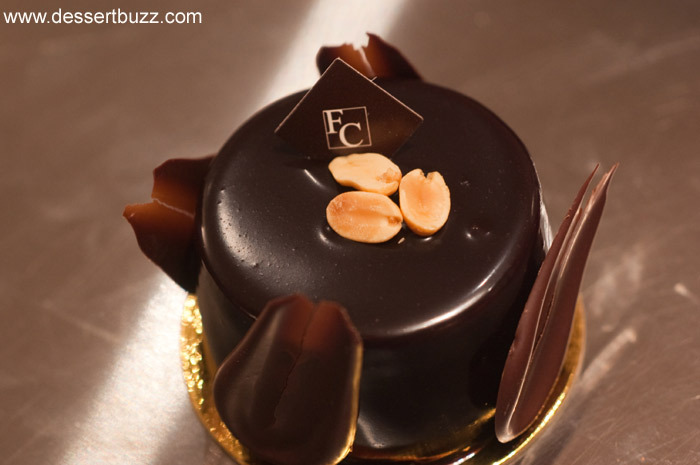 DessertBuzz: One thing that I come across frequently when speaking to people about desserts vs. savory dishes is that they don’t seem to appreciate how much time it takes a pastry chef to put together one of these high end pastries. Francois Payard: It’s a problem in America, sometimes people cannot appreciate the difference between something incredible and something simple. Like the cupcake. Why is the cupcake so big? It’s ok. It’s just even good. And you know what? To make a cupcake you can even make it with a mix and frosting. My daughter can make that! I’m sorry I don’t have a daughter! But I would like to say that what we do, you need a talent. You need people with training. It’s like comparing the restaurant Daniel and going to a brasserie? It’s still food, but what kind of food? You go to a restaurant for an experience and you go to a brasserie every day for lunch but people sometimes think it’s the same thing sometimes. The (the fuss over) cupcakes and everything is a little bit too much now. FP: I think because Americans, and you have to make sure what I say is sometimes tough are very kiddish and that’s the reason why a cupcake (is so popular) it’s funny and everything, but for me I don’t see the $4.50 on the cupcake and I see $6.50 on the cake and people tell you $6.50 (is too expensive for the cake) just try to make a triple decoration on the side of a cake, try to make a decoration. DB: Do you ever take some time in the kitchen and just experiment like a child? FP: Every Payard cake, I created all of them. Even if I have my business (to attend to ) I can eat cake in my mind. Let me explain to you. See the cake for Valentine’s Day? I just wrote the recipe on paper and I gave to my chef to make it and I already eat the cake! How? I know what the sable breton tastes like, I know what the mascarpone cream for the Napolean tastes like, I know what the vanilla pound cake that I make tastes like and I know the mousse that I used to make for the Notre Dame. Now, I just put them all together and I was eating the cake already, but I need to make a final taste to really taste it, pretty much that is the way I create things. This year was an incredible year (for the number of new cakes presented), few people understand because when you talk about sophisticated taste in pastry-everybody loves sophistication in the kitchen-but not like in a pastry cake where they like to be more basic. Our cake (we made this year) was a chestnut mousse, vanilla pound cake yuzu and green tea filling and a mint chocolate sugar for the crunch in the middle. When I make that, it was an incredible taste but I knew the chestnut is a beautiful and delicate flavor, I knew the yuzu make it a little bit acidic to bring all the flavor of the green tea together and open the chestnut without being too much acid for not killing the chestnut because it’s delicate and the vanilla pound cake to bring the vanilla from the chestnut in the chestnut base. Right away, I may need something and I put this layer of chocolate for the crunch for the texture. DB: You sound like a painter where you see the art on the canvas before you paint it. FP: It’s the same thing. That’s the way we build cake, but many times, I would like to say, sometime it works sometimes it doesn’t. It works pretty much all the time when you make it simple and if you want to try to be very complex with many different things sometimes it works sometime it doesn’t but that ’s the way you create things. DB: Last week I was speaking with a pastry chef who worked at Le Cirque and is pretty accomplished and he was saying he’s been disappointed in the recent pastry chef graduates, he said he felt like a lot of them did not seem willing to pay their dues. FP: I would like to say in NY or maybe in America, everybody wants to be a chef very quickly. But that’s (the) American way, everybody wants to make money. You live with mom and dad you really want to accomplish what I accomplished in 40 years. It’s not just American way it’s the way we’re living in the new century. Nobody, even in Europe, nobody wants to pay their dues like they used to before. I used to work in a 3-star restaurant in France where the chef worked 14 hours a day! DB: Ok, I’ll try again, can you to recommend any specific desserts that you’ve encountered in the last couple weeks or months in NY? FP: No I can’t tell you which people I like that make a very good dessert. I can tell you Michael (Laiskonis at Le Bernadin) makes a very, very good dish that I really like, Johnny (Iuzzini, from Jean Georges) makes a very good dessert, I like Locanda Verde’s (Karen DeMasco) dessert, very much, more bistro-style because it’s a more casual place, but full of flavor, very good flavor. A few other people make good dessert. I went to this bakery in Brooklyn, Almondine its very very good, it’s more like a French pastry shop but more Americanized, they have a very good croissant and I think that’s what people want every day now. I always tell people they can have anything they want for show but at the end of the day, you come back for the food and for something you like and I’m not about nitrogen technique, I learn the technique but they do nothing for me. the end of the day I’m looking to have food on my plate. I prefer to go to a A Voce, a great Italian restaurant, or Babbo to a fancy nitrogen pasta or anything. 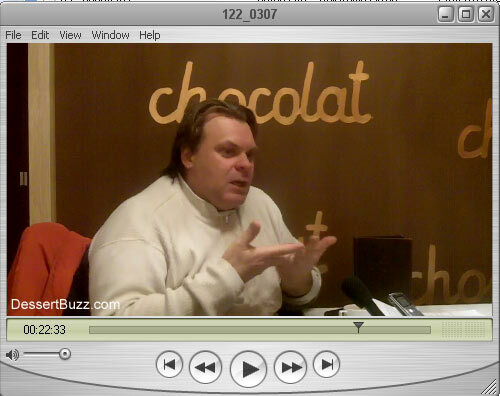 I like restaurants for an experience, like El Bulli, that’s an experience but you have to fit it in the right place. More and more, people will come back for real things or revisited dishes that they know well. You may take a traditional recipe and reinterpret it. Your grandmother maybe used to make the best chicken you ever had. If you successfully revisit that chicken recipe, that to me that is more impressive (than the show dishes). DB: Do you have a minute to take me through the different components of one of the more involved pastries in your case? Go here for a video of Francois discussing the inside of a George V pastry. For Part I of the interview go here. 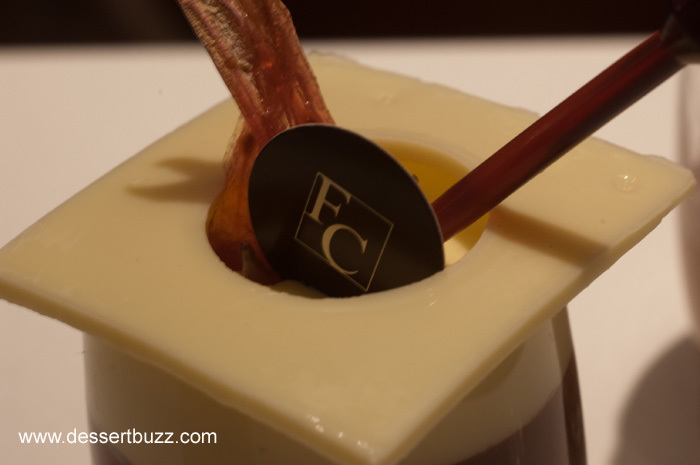 Francois Chocolate Bar is located at 63 and Madison inside the Mauboussin jewerly store. Dessertbuzz | Francois Chocolate Bar still has some of the best pastry in NYC-if you can find the shop!